Fight the Scourge of Waste with the Waste Watchers! 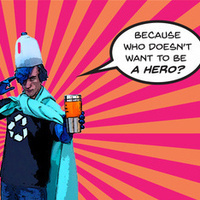 Join the Waste Watchers Club in Student Experience Center room 206 (Center for Civic Engagement office) from 5:00 pm-6:30 pm every Thursday (January 10th-March 14th) and save the world from the villainy of waste! Come on by to meet fellow heroes who share your interest in sustainability, and learn about our waste-fighting squad! Club is free and open to all currently enrolled students. Visit our website for more details about the club and one-time volunteer opportunities.